Plateau Queens defied all the odds to edge out match favourites Tartar Girls from Pokot 4-3 on post-match penalties to win the Chapa Dimba Na Safaricom Tournament. With the win, the Queens also earned a once-in-a-lifetime opportunity to travel to London for training and mentorship programme with Harambee Stars Captain Victor Wanyama and a Sh1 million cash prize. After a 1-1 draw during regulation time, all eyes turned to their goalkeeper, Judith Osimbo, who did not disappoint, parrying away two penalties to ensure the team wins. Football pundits had tipped Tartar Girls, who have a rich football history to beat Plateau Queens. But the latter’s coach says they had prepared well for the tournament and the chance to travel to London was the golden prize nudged them forward. 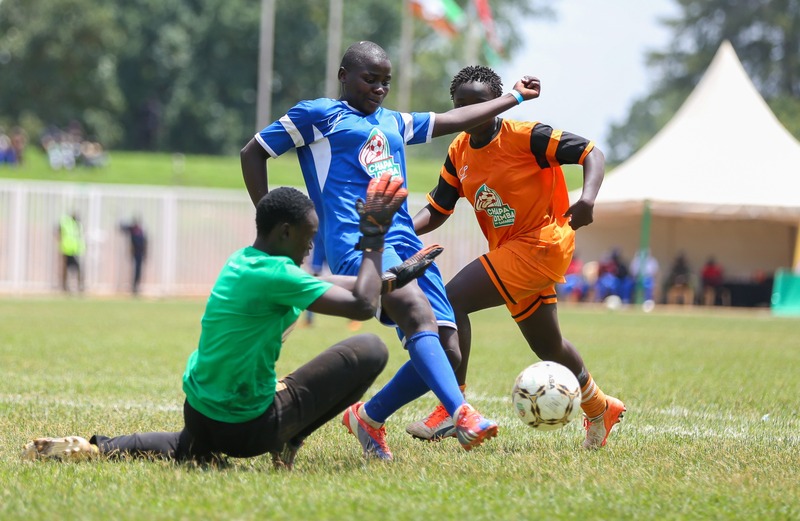 Plateau Queens goalkeeper Judith Osimbo goes for the ball against Tartar Girls player Sylvia Baraza during the Chapa Dimba Na Safaricom national finals at Bukhungu Stadium, Kakamega. Plateau beat Tartar 4-3 on post match penalties. “The money wasn’t really the driving force. These girls wanted to travel to London and experience what life is like over there. They vowed from the onset that they would work hard and I am really happy we achieved this goal as a team,” coach George Omondi says. “To prepare for the national finals, the girls did not even break for mid-term but remained in school to practice. We also camped at Bukura, Kakamega for 10 days before the national finals started and where we took part in high intensity training. I was confident no team would beat us,” he added. We finished third in the National Secondary School Ball Games last year and this win is just a culmination of the hard work we have put in as a school in sports,” Omondi says. Plateau Queens is the School Team of Nyakach Girls High School, and just like the name suggests, they are located on a plateau in Nyakach Sub County, Kisumu. Their efforts have seen two of their players earn call up to the Kenya Women’s U20 side; goalkeeper Judith Osimbo and Mercy Akinyi, who was the top scorer in the national finals with six goals. Their defender Beryl Eshituku was also named the Most Valuable Player (MVP) of the tournament. 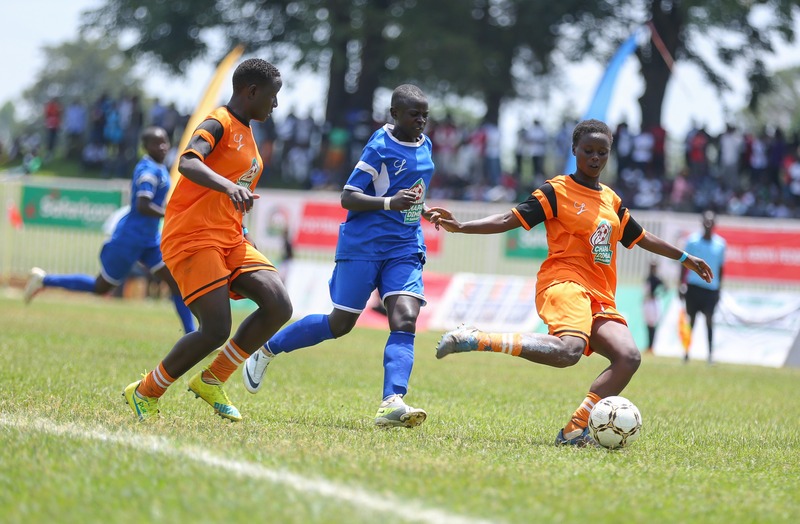 Plateau Queens player Eunice Anyango clears the ball away from Tartar’s Leah Wanyama during the Chapa Dimba Na Safaricom National finals at Bukhungu Stadium, Kakamega. Osimbo says she hopes to make it to professional football for an internationally acclaimed team. The MVP, Beryl Eshituku, has already secured a scholarship at the University of Oklahoma, US courtesy of her exploits in the Chapa Dimba Na Safaricom Tournament. “I am really overjoyed and feel privileged to have impressed during the tournament. Renown Youth Coach John Bob Oyugi saw my potential during the tournament and through his contacts got me full scholarship to study Sports Management and International Relations,” she says. Coach Omondi also credits the win to Nyakach Girls High School Principal Bora Okaalo. “She has been very supportive and she champions for girls’ empowerment through sports. Majority of these girls come from extremely poor backgrounds and cannot even afford school fees,” said Omondi. “The Sh1 million prize money will go a long way in ensuring these girls remain in school and concentrate on their studies and football. We are really grateful to Safaricom and the entire Chapa Dimba team,” he said.